Meet your dentist first. Before any treatment takes place, ask to meet your dentist in person. 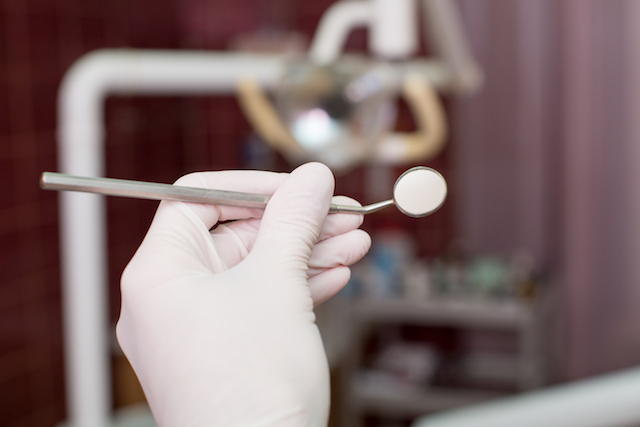 Dental offices are usually more than willing to schedule consultations. Schedule an early appointment. Get your appointment done first thing in the morning to help eliminate the chance of stewing over it all day. Talk to your dentist about it. Be upfront and honest about anxiety at your appointment. Have your dentist explain everything beforehand and ask him to speak out loud as he is performing tasks. Use a signal to stop. Before you begin, agree on a sign that you can use to stop if things get too uncomfortable. Bring a family member. Feel free to bring along a close friend or family member; a good support system can go a long way. Listen to headphones. Most offices supply these, but bring your favorite pair of earbuds just in case. Listen to some relaxing music or a podcast to help time move quickly. Consider meditation. Distract your mind by concentrating on deep breaths or repeat a calming mantra in your head. Picture yourself elsewhere. Drift away to your favorite relaxing place. Think of the sounds of the ocean, the view from a picturesque mountaintop or the cool breeze among of quiet field of flowers. Hold something. Release tension by bringing along stress ball or something soft to squeeze. Close your eyes. Try to relax by closing your eyes. Maybe even bring your own sunglasses if it helps you stay comfortable.